Not only does the normal Boss DR110 not have a DIN-sync or Midi input and therefore can't be synced to another device, but its internal clock runs at 12ppqn (pulses per quarter note) so even if you wired in a standard 24ppqn sync input the DR110 would run at twice the speed of the master device. There are also issues with the play and stop functions on the standard unit as the DR110 was never designed for DIN-sync and therefore doesn't normally respond properly to the DIN-sync run and stop protocols. On most DR110 sync interfaces you see around the net you end up in a situation where you press play on your master device, the DR110 starts in sync, but when you press stop on the master and the DR110 stops, it doesn't reset to the start of the bar again. This means when you then press play again on the master, the DR110 just starts from whatever random position in the bar it stopped, regardless of the master device starting from the first beat of the bar. You can get around this by pressing stop on the master clock, then pressing stop on the DR110 to reset it, then you have to press play on the DR110 to arm the sync again before pressing play on the master clock. Its really not the ideal way of working, as you inevitably find out the 50th time you forget to re-arm the DR110 playback and end up smashing it against the wall in frustration! This DIN-sync kit is different, as not only does it add a standard 24ppqn DIN-sync input with an interface that converts the clock down to the 12ppqn required by the DR110, but it also also fixes and automates the play/stop issues. Using this kit, when you press stop on the master the DR110 stops, automatically resets itself to the start of the bar and re-arms the play button to wait for another start signal. When you press play on the master device everything starts exactly in sync again from the start of the bar.. 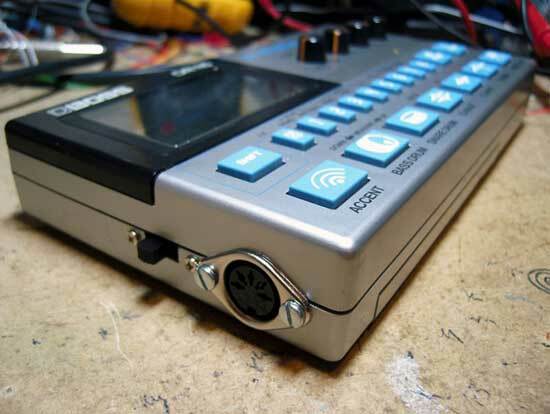 The DR110 can only be a slave device via DIN-sync, but you could always slave the DR110 to something else and then use the accent trigger output to clock another bit of analogue kit, such as a SH101 sequencer. In the kit you get a 5 pin DIN socket with two fixing bolts, a sliding switch with two fixing screws, and the DIN sync interface sealed in heat shrink tubing, with the external wiring already soldered onto the board. Its sealed in heat shrink so that it doesn't short to anything on the DR110's circuitboard when you seal up the case. Theres not a lot of space in there! When the kit is installed the DR110 has a DIN-sync socket on the side, with a sliding switch to select between internal and external sync. The machine will still fit into the carry case that all DR110's came in. You can still program patterns in realtime/TAP mode with the DR110 running and synced to another device, but if you want to use STEP programming mode you have to switch the sync source back to internal to free up the play and stop buttons for programming duties. You can't play the patterns while writing in STEP mode on a standard DR110 anyway, so its not really a problem. PLEASE NOTE: Roland/Boss really didn't take timing very seriously on the DR110. Due to some bizarre design choices, delivering a clean timing clock to the CPU appears to be reliant on the pulses for reading some of the front panel buttons not getting in the way. As a result you may sometimes find that hitting certain drum pads at precisely the wrong time while the unit is synced to an external device, may cause the DR110 to see a sync pulse where there shouldn't be one. 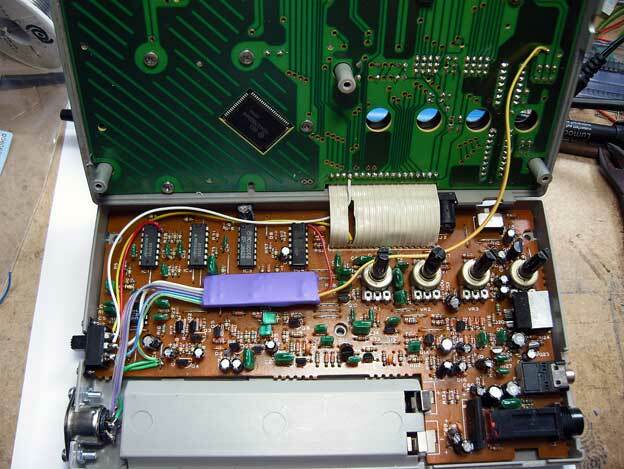 This results in the DR110 going slightly out of sync with the master clock. This still occurs when the DR110 is running on its own internal clock, but obviously its a lot more difficult to hear it when the machine is free running and not synced to another unit. Usually it only happens when you hit multiple pads simultaneously, and even then it will happen rarely and only on certain pad combinations specific to your machine. In normal use you'll probably never even come across this issue as you'll just be playing.synced programmed patterns. Below is a demo of a DR110 modified with a DIN-sync interface, synced to a x0xb0x. This one also had some fairly major sound parameter mods. While we are happy to offer installation support and answer any questions you might have, theres only so far we can go with troubleshooting via the internet. If you've read the installation guide and you don't feel confident about your ability to install this kit correctly, please think again about purchasing it. All kits are tested for operation and timing consistency before shipping, so if you can't get it to work, it is most likely down to an installation error. We cannot accept a return if an attempt has been made to install the kit. Please note that it clearly says DIN-SYNC and not MIDI all over this page. I can't quite believe that we're having to say this, but we're not going to refund you if you buy a DIN-sync kit, and then complain that the MIDI doesn't work!